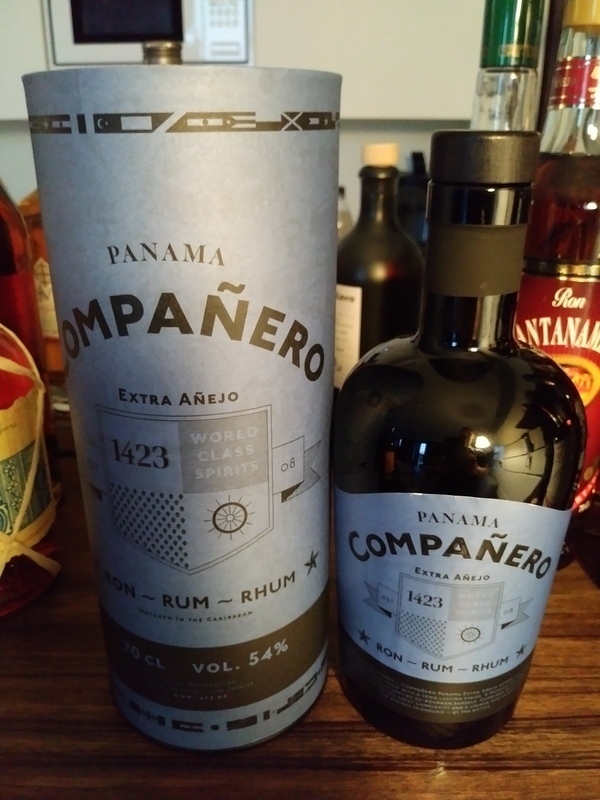 Have you found an online vendor selling Companero Panama? Chokolade, og så behøver man faktisk ikke skrive mere. Der er knald på mørk chokolade i duft og smag. En anderledes rom, men den store fokus på chokolade gør den virkelig interessant. Det er helt klart den bedste rom fra Compañero, og hvis jeg kunne finde den i handel, skulle den have en plads i mit skab, fordi den ikke ligner de andre typer rom, jeg har. 23. December i romkalenderen 2017. Amazing, simply amazing rum. Thank You so much the geniuses from Vinoble at Skanderborg for recommending such an amazing rum. Very nice and sturdy box surrounding a great looking bottle and nice label. Yellow golden color. Stunning chocolate flavors to both nose and palate. No burn at all. Jumps directly to my Top 5 rum list from well over 800 rums later. If you enjoy a sweet rum with a nice touch of alcohol burn, this is the right choice. A nice scent and taste of chocolate. Great rum! Helles honiggelbes Bernstein mit Goldreflexen im Glas. Im der Nase, tropische Früchte, Orangen, Bananen und Eichenholz die mit einer dicken Schicht Kakaopulver bestreut sind. Etwa so wie du an einer Dose Nesquik schnüffelst. Im Abgang ein wenig Zitrusfrüchte und noch mehr Kakao der lange anhält. Ein Rum der seine Schokoladenseite zeigt, für Einsteiger und Geniesser. Bright honey yellow amber with gold reflections in the glass. In the nose, tropical fruits, oranges, bananas and oak wood sprinkled with a thick layer of cocoa powder. Just like you sniffing a box of Milo. In the finish a little citrus and more cocoa, long-lasting. A rum that shows its chocolate side, for beginners and connoisseurs. 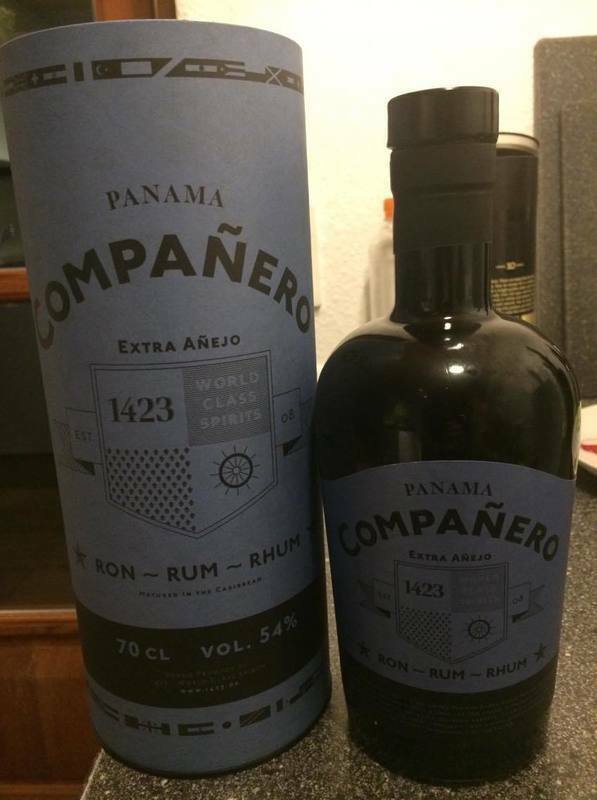 Well-aged rum from Panama, independently bottled by Danish bottler 1423 for its Compañero range. Ought to be great for sipping as a postprandial tipple...Tobacco, milk chocolate, orange peel, a touch of earthy tomato stem. Wow , from the moment you open the bottle the room gets filled with the smell of chocolate. A 12 year old rum bottled at an impressive 52%. Smells wonderful with a bit of citrus and vanilla in with the mountain of chocolate..
Sips brilliantly with a good warm burn in the mouth but not in the throat. Also nice with ice , plus mixed with lemonade tastes like chocolate mousse !! That all being said , would I buy another bottle ? Im undecided..
A bit like plantation stiggins fancy , one bottle might be enough..
finally: great compose, very original but it's one moment with much of alcohol in taste...too much. But when is 54 % It's understable. I was thinking about mark 7 or 8. I tried with coke...very bad. So finaly mark 7. 20ml uit een advent kalender. Karamel, cacao. Gebotteld op 54%abv. Niets mis mee. Noch nie so etwas getrunken!! This is something positive different, but doesn't really feel like a rum. I'd like to rate it 7.5, cuz a 7 feels too cheap but a 8 too high, still I round up. Palate: also chocolate, but combined with an unneccessary sharpness. Could be smoother. Special smell, never smelled chocolate like that before. There really is srong infulence of chocolate in nose and even in the taste. In the mouth rum brings lot of warmth thanks to its strenght. This should be excellent mixer for few types of cocktails, but i cant see it as a sipper for whole night. Den her er jeg positivt overrasket over. Chokolade dominerer både duft og smag, og der er god smæk på med de 54% alc. For at komme længere op inrating, synes jeg der bør være lidt flere smagsnuancer. Heavy scent of chocolate when it first hits the nose, it's also quite chocolately in the taste, a lot for sweetness. Was great with a little glass (2 cl. ), but I think it will be a bit too much with all the chocolate with a bigger glass. Mycket god doft, choklad. Krämig och god smak, choklad i smaken också. Lite Baileys. Känner inte att den har så stark alkoholhalt.